Physical or verbal warfare can never rid us of racism; what we need is love and marriage, interracial: When people of different colors, cultures, and languages come together and treat each other's differences patiently, tolerantly, and understandingly, the differences bring forth a unique congruity. Of course, this journey is not full of flowers and smooth rides; it can have more obstacles than anybody imagines: not long ago, interracial relationships were still a forbidden topic. That is why many Eastern and Western readers eagerly wait for books to address possible related problems and provide solutions. Some of those people hope to find guidance and advice for their existing or future interracial relationships, some need case studies for sociological research, etc. Our anthology is an effort to satisfy exactly these needs. 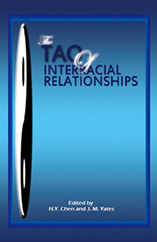 It includes twenty four stories encompassing all kinds of tears and laughter related to interracial relationships. Those who are looking for answers will have a knowing smile after finishing the book. J. Michael Yates, BA, MA, PhD, LLD. A well-known writer and university professor, Yates was born in Missouri and did graduate degrees at the Universities of Missouri and Michigan. A unique voice in the literary field and a widely published author of poetry, fiction, drama, translations, and philosophical essays, he has won numerous literary prizes, including the Major Hopwood Awards (both poetry and drama the same year) and the Lifetime Achievement Award in the Arts and Sciences from University of Missouri. Visit Yates' personal website for more information. Hongyun Chen Born in Linchuan, Jianxi, China, Chen did her degrees at the Second Military Medical College (M.D.) and the University of New Brunswick (Ph.D.). She began writing initially for Chinese Electronic Magazines around 1995 and hasn't stopped since. Her essays and short stories have been widely published in Chinese and English both in North America and China, some of which won Chinese literary prizes in the U.S. and Canada. She is one of the two translators of this book. Hongliu Chen Hongyun's sister, Chen is a translator for a French company in Hangzhou, China. She studied International Business Management at the University of Aalborg, Denmark. She loves philosophy, literature, writing, and most of all, soccer. © 2016 Cacanadadada Press. All Rights Reserved.